For those who are reading this from out of town, Pattaya has just experienced the heaviest rainfall in years this week. Severe flooding was seen just about everywhere, so we wait to see how the courses we shall play this week have held up. The Golf Club held up just fine, but we had water lapping up on the doorstep like most places on the soi. Watch this space. Dave Mather is a frequent visitor from England and is a most consistent player, even when he hasn’t swung a club in months. His muscle memory is amazing. Keeping the proper level of blood to alcohol is no easy task, but Dave has mastered the art and it was evidenced by last week’s victory at our regular Monday venue. A well played 38 points for Dave took him to the top! 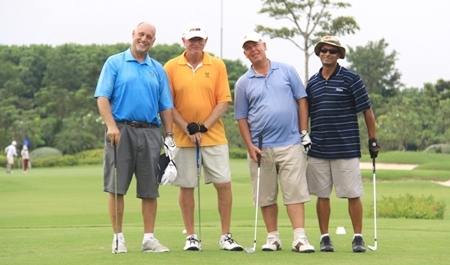 Jimmy Brackett, Grant Cadell, Paul Young & Mike Meir at Kabinburi. Good buddy quizmeister J.J. Wright was 3 back of Dave and not quite to his handicap with an admirable 35 for second. If J.J. is around, you don’t need Google for any sports trivia answers. John (JTB) Dearden was a shot behind for his third place finish. Strange but true! We had two identical days in a row for KSC results. Both winners also won near pins and the rest were determined by a 4-deep count back on both days! Paul Young and young Brad Sproxton (fresh back from the Canadian Rockies) took top honors on this September road trip to Kabinburi. Bob Newell hosted this event up north and our thanks go out to him for his fine job of herding cats. As usual, road trips are always full of stories and this one was no exception. The bunkers at KSC have always been known to contain an exorbitant amount of sand. We have even had lost balls in them before, but this time Grant Cadell almost became the first golfer to get plugged in a bunker. His playing partners rescued him from what could have been certain death! The next time we play here, it will be a scramble so that we avoid the nasty bunkers and rough that mar an otherwise lovely golf course that is beautifully maintained on the tee boxes, fairways and greens. Have you ever had a 2 for 5? What is that, you might ask? Well, Mark Wood eagled on the “Deer hole” 15th handicap 3 hole to write on his card 2 strokes for 5 points! His 5-wood from 210 yards out was a thing of beauty all the way. Tuesday night was spent at the Thai Cowboy bar across the road from the Kantary Hotel for an evening of dinner, drinks, sing-along and karaoke from the Bob & Brad show who joined the band with reckless abandon. It was good to have our Costa Rican expat buddies with us once again and Jim and Capt. Bob had a fine 2 days of golf. Thanks go out to the Kantary Hotel, Kabinburi for their hospitality and beautiful rooms and facilities that everyone truly enjoyed. We shall definitely return! Another fine trip out to Mountain Shadow that always has the sign-up sheet full as soon as it gets put up. This is one of the best courses in town right now and its popularity is well deserved. Known as having probably the best- yet trickiest- greens around, there will always be a 3-putt green on your scorecard. Expect a few of those and don’t let it get to your head and you will handle this course much better. That is exactly what happened for Jack Spencer and to shoot your handicap here is a fine result. Jack had his flat stick working well as he got them close enough for mainly 2 putts to control the course and play it his way. That was a great display of course management Jack, well done! Marlene once again gets her picture in the paper as she showed her fine form on a tough course. Another good round for Tim Lazecki put him in a rock steady third place. 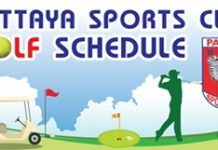 Thanks to all for participating in this week’s fixtures, and don’t forget to check us out on facebook /golfclubpattaya for updates and the September golf schedule. Note: The Golf Club is located on Soi LK Metro, off Soi Buakhao and Soi Diana junction. We can be reached on 085 434 3377 or [email protected] and our is www.golfclubpattaya.com.